Whilst idling on Twitter this afternoon, I clicked a link from BBC Good Food magazine about recipes to cook with your children. 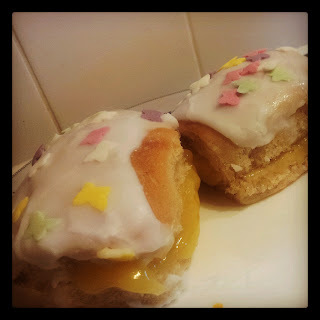 In amongst a plethora of cupcakes and brownies, there was one recipe for iced buns. I don't know why, but I got fixated on the idea of making my own iced buns. I don't even really like them. But today's planned Duck and Pink Grapefruit Salad got postponed and I found myself on a mission to make buns. I think the reason I don't really like them is because a) once you've bitten off the icing layer, they're just a bread roll (and not too good a one at that); b) there are a million other ways I'd rather up my calorie intake and c) when I was a child, my mum used to work in a bakers and she could bring home whatever cakes were left at the end of the day. The leftovers were always cream doughnuts (but ones with fake cream - it was the eighties after all!) and iced buns. I think I probably ate too many of the things. Some twenty years on since I last ate one, it seemed like a good idea to try them. I know that they baked them for one of the technical challenges on the Great British Bake Off this year and I remember shuddering at the time as Paul Hollywood filled them with fresh cream. Such a waste of good ingredients. Nevertheless, like a woman on a mission, off I set to make them. The Good Food recipe started with a packet bread mix and added things to it. Of course I didn't have one of those in the cupboard so figured that I'd just make the recipe up myself, using my regular bread recipe (minus the olive oil) and add an egg and some sugar. I also added some salt to balance out the sugar and a teaspoon of vanilla bean paste to make them a little more grown up. My dough was beautifully soft and blousy after the first rise. And when I removed it from the bowl, very elastic and quite sticky with it. I oiled my hands and the worktop with spray oil which seemed to keep it from sticking, but I found it really hard to shape the dough into fingers. Being so soft, I just knew it was going to spread sideways too much, rather than forming the straight, narrow buns I was after. Forty minutes later and my buns were very square. 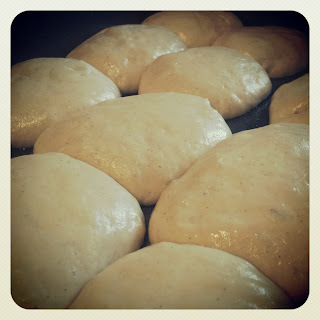 Undeterred, I popped them into the oven and 12 minutes later, I had some lovely warm, vanilla-scented buns. The outer shell was crisper than you would get on a mass-produced bun (but then it's the same with bread - who on earth can make soft-crusted Mother's Pride-type white sliced bread at home??) but the inside was really lovely and light - probably because of the extra yeast. I really should've read Paul Hollywood's recipe before making them (I have the book after all) or read the bit in Short and Sweet again about the science behind bread dough. I now know that Hollywood doubles the yeast and he adds a little butter and a second egg to his mixture. He also kneads on a floured rather than oiled surface. That's interesting because I know he's always on about not using flour because it makes the dough drier. But who am I to question the master? Maybe that's why mine were harder to shape? I also had a bit of an icing fail. I probably added about three drops too much on the water front and it slowly slid down the side of the buns. Not fast enough for me to realise it was happening at the time so I could've adjusted the mixture. Nevertheless, I will be more careful next time. It's amazing how a few drops can make such a difference with icing. Overall, they're not bad. I shared an uniced bun with Miss A and the dogs while they were still warm and the vanilla really came through. They definitely need the salt as well although probably only the one teaspoon unlike the two that Mr Hollywood uses. I'd probably even go so far as to bake these again. I'd intended to use up the last bit of raspberry curd that was left over from my epic raspberry and lime cake the other day but sadly it had 'decomposed' so I had to make do with shop-bought lemon curd. I think lemon zest in the dough along with fresh lemon curd in the middle and a sharp lemon icing on the top would tick all my boxes on the lemon front. If I can just master shaping them, I'm on to a winner. If using instant yeast, stir this into the flour. If using dried active yeast, put the water into a measuring jug and dissolve 1 tsp of the sugar. Sprinkle in the yeast and leave to bubble for ten minutes. Stir the sugar into the flour then make a well in the centre and pour in the liquid and the egg. Add the vanilla bean paste and mix to a soft sticky dough. Cover and leave for ten minutes. Lightly oil your work surface and hands, tip the dough out and knead for ten seconds before returning to the bowl and covering. Repeat this twice more and then leave the dough to rise in a warm place for an hour or until doubled in size. Lightly grease two deep sided baking trays. Divide the dough into sixteen pieces and shape into long roll shapes. Place in the baking pans leaving space for them to double in size. Leave to rise until doubled in size (about 45 minutes). Meanwhile, preheat the oven to 220c/200c fan/gas 7. Bake for twelve minutes until risen and golden. Make the icing by carefully mixing the water into the icing sugar until a spreadable consistency is reached. 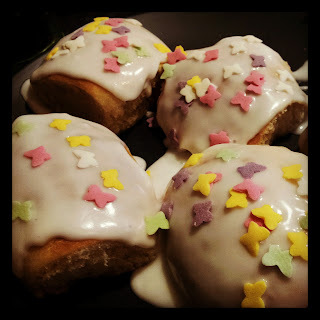 Use a palette knife to spread icing on each bun, sprinkle with decorations and then leave to dry. Finally, if filling, add a liberal amount of fruit curd or jam to the middle before serving.